Home : Blog : What is Hair Transplant Surgery Like? And How Does NeoGraft Do it Better? What is Hair Transplant Surgery Like? And How Does NeoGraft Do it Better? If you’ve noticed your hair is thinning or are bothered by a receding hairline, it’s likely that you’ve spent some time Googling your options. A quick search may yield some too-good-to-be-true products or supplements alongside tried-and-true methods, like transplant surgery. Most of our hair loss patients began their journey in the same way, trying special shampoos, daily vitamins, and questionable products in the hopes that they could restore lost hair. Ultimately they wasted money, time, and hope on interventions that simply didn’t work, leading them to considering a hair transplant. The prospect of any kind of surgery can be scary—and many patients worry that even hair transplantation won’t deliver results. But, for many patients, a successful hair transplant is life-changing. Buzzfeed recently documented one man’s experience, and we think it’s worth a watch. 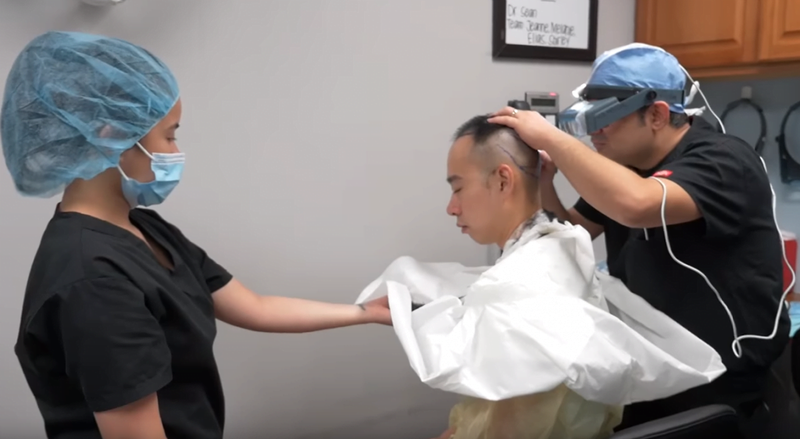 The patient discusses all the methods he tried in the past, commiserates with friends experiencing hair loss, and finally shows his consultation process, procedure, and recovery afterward. The video above highlights the Follicular Unit Extraction (FUE) method, a technique that improves upon past methods. It involves removing individual hair follicles from areas with naturally fuller hair and transplanting them to the spots that are thinning or bald—without a large scar on the back of the head. However, FUE has a fairly long procedure time and can be quite uncomfortable for patients. Hair loss sufferers now have a new transplant technique to consider: NeoGraft® hair restoration. This method was developed to address the disadvantages of hair transplant surgery while still providing impressive, natural-looking results—and it is rapidly becoming the favored method. NeoGraft is a follicular unit extraction procedure that reduces procedure time, lessens patient discomfort, minimizes downtime, and, most importantly, increases the take rate of the transplanted hair follicles. By automating the process of harvesting and implanting individual hair follicles, NeoGraft not only eliminates the need for a linear scar, it also leaves less room for error or follicle disruption during the harvesting and transplantation process. If you’re in the Eugene area and would like to know more about your hair restoration options, we encourage you to contact us to schedule a personal consultation with Dr. Movassaghi. He can help you determine if NeoGraft is the right fit for you and answer any questions you may have.